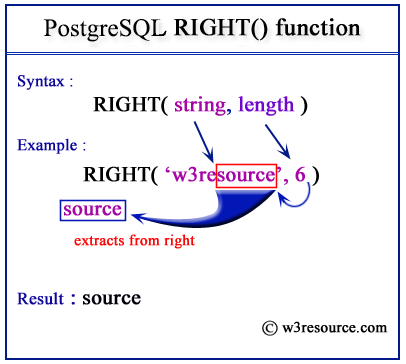 The PostgreSQL right() function is used to extract n number of characters specified in the argument from the right of a given string. When the value of n is negative, the extraction will happen from the right except for first n characters. In the example below, the rightmost five characters from the string 'w3resource' have been extracted. In the example below, the right function extracted all the characters from the right side except 3 leftmost characters from the string 'w3resource', because the value of extracting character number is negative.